ജാടതെണ്ടി.കോം : Balasaheb moves on..
Balasaheb Thackeray passed away yesterday and thus leaves us a big void in our country's democracy. A small faction of people hated him and preferred to subject him as a right wing leader instead of being a mass leader from mumbai. Yes he was a staunch supporter of the Maharastrian Manoos and would fight with tooth and nail on warding off Anti-Hindu elements. But every community and society brings up that social leader who stands up for his people and fight for them. I admire Balasahebji for not only being that peripheral figure in Indian Politics but also for his stance on protecting the nation. In these days of soft speaking back stabbing politicians we had a tough talking 'i-do-what-i-say' sort of leader. His idea of uniting people across religion was based on ethics and not by blind faith, but still with a predominant Hindu agenda. He was once named among the top 10 powerful personalities in our country. And silently known as a man who could bring Mumbai to a stand still. Having said all this there is pros and cons in being Bal Thackeray. From a cartoonist to a reporter to an editor to a politician. The ride has been always an uphill but held together by his ethos and nationalism. His views were not easily digested by the soft spoken secularism feigning Indians. And were always polarised and provided fiesty headlines in the media. But he was not going to buckle under pressure and kept going on with his hammering views. I wouldn't say we must preach each and every words he publicized but I admired the charisma in him to speak out his mind. He spoke for the majority and knew exactly what he wanted for them. Balasaheb's death is an irreparable loss in every manner and with Uddhav and Raj Thackeray left to fight it over for supremacy. But as well all know both of them cannot fill the shoes of Balasaheb. Indian Politics lost its own Vito Corleone and you wont get a Godfather like him every day its much more rarer than a Halley's comet to be precise. 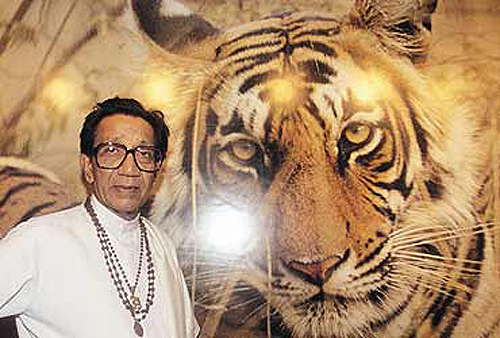 BalaSaheb! May his soul Rest in Peace. May his soul rest in peace! Indeed there are very few people who polarized the masses in the name of nationalism but you have no idea of the number of people who lost their lives for being Indian and non-Maharashtrian in Bombay. I endorsed violence and I think his party came to power only once in Maharashtra. Wonder why? "Politicians in my country are making sure jobs are given to local people either by law or force or just killing the rest of them. America must be proud in itself when a South Indian like me feels more safer here than in streets of Mumbai. I have seen Non-Tamilians humiliated in Chennai and Tamilians kicked in Bangalore." Truly said 'Anonymous'. Yea, its true I haven't been in the hotspot of mumbai those days. And maybe my views are influenced a lot by my fellow maharashtrian friends as well. I like his frank manners to media and public other than that , I am no good to talk about his politics. Sorry! !